CAMP RUPERTO K KANGLEON, Palo, Leyte – Eastern Visayas is eagerly awaiting the coming of His Highness Pope Francis next year from January 15-19. Police Regional Office is now intensifying its security plan to ensure the peace and order of the momentous event. 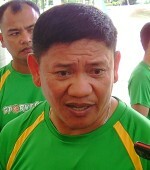 PRO8 Regional Director, PCSupt. Henry P. Losañes expresses his optimism that Pope’s Visit in January will be very peaceful and orderly one. He said that augmentation forces which are approximately three thousand PNP personnel to include personnel who are handling administrative functions will be deployed to secure the safety of the Pope and other visitors, both domestic and international. Around 1 to 2 million people are expected to attend the High Mass which he will officiate. The Archdiocese of Palo has yet to announce the venue of the Pope’s Mass. Reports have indicated that the Pope will be visiting areas devastated by super typhoon Yolanda. Initial meetings have been conducted between the church, the police and the local officials to ensure everybody’s safety. The Pope is likewise expected to visit the Palo Metropolitan Cathedral which is now under renovation after it was heavily damaged by ST Yolanda last year. Traffic Plan during the visit was discussed during the Coordinating Conference last September 11, 2014 at PRO8 Conference Room. Other significant matters were the following: Traffic flow; Camping and parking area which will be in first come, first serve basis at the Government Center, Brgy Candahug and Youth Camp fronting Andoks at Brgy. Pawing, Palo, Leyte. Tents will also be installed for the visitors, Decals will be issued to all vehicles which will be used as convoy and color coding will be implemented for the VIPs. Strictly, no parking from Coca Cola junction to Palo, Leyte, a tow truck will be available to clear the areas where parking is prohibited. Umbrellas are not allowed around the venue. Vehicles traveling from San Juanico Bridge going to Ormoc City will take the Tigbao to Sta. Fe route and those from Tanuaun, Leyte can pass thru the Government Center and Vice Versa. Passengers can be picked up or unloaded along this route but parking will not be allowed. All commercial flights are expected to be cancelled during the visit. PNP personnel and other force multipliers will be deployed along the said routes. The influx of people who will be coming to the region to witness the Papal Visit presents an opportunity to lawless elements and threat groups, who may take advantage of the situation however, the Police, the Church and the local officials, will undertake police operations and other security-related activities and/or measures to ensure the success as well as the orderly and peaceful visit of the Pope. CEBU CITY – The Ramon Aboitiz Foundation Inc. (RAFI) has received 295 nominations for the 6th run of the RAFI Triennial Awards, 97 of which were for the Outstanding Institution category while the rest were for the Exemplary Individual category. Of the 295 nominees, only 98 accepted the nomination and submitted their documents for screening; thirty-four of these were for the Outstanding Institution category, and the remaining 64 were for the Exemplary Individual category. In September, the RTA Internal Screening Working Group (ISWG), which is composed of RAFI employees and officers, would evaluate and identify the top 30 nominees per category. The remaining 60 nominees would then be endorsed to the RTA Search Committee, which would further screen the list to come up with the seven semi-finalists per category. Field validations by the ISWG and RAFI’s external field partners would follow for most of the last quarter of 2014 and early next year. The awarding ceremony is slated in June 2015. Mel Yan, RAFI for Citizenship, Leadership and Governance senior program officer, shared that recognizing those who exemplify in uplifting communities is not just the goal of the award-giving body. RTA was also created to share the stories of these people and organizations to inspire others and get people to support the cause, initiative or advocacy they are involved in. “We want to tell the whole world, that in the Philippines – the Visayas and Mindanao in particular – there are people and institutions out there that are doing good work for the community and contributing to community development. The purpose of the Triennial Awards is to tell stories and to tell good news,” he said. The Triennial Awards which is conferred every three years, recognizes individuals and institutions who have contributed to community development and who shares the ideals and beliefs of the founders of RAFI, Don Ramon Aboitiz and his son Don Eduardo Aboitiz. LONGYEARBYEN, Norway – As the Arctic sea ice reaches its lowest extent of the year, Filipino climate commissioner Naderev “Yeb” Saño is at the ice edge with Greenpeace to demand that world leaders take action on climate change at the upcoming summit in New York. “I was born over 8500 kilometers from the North Pole, and yet I have come to realize that my future, and the future of my country, is tied to the fate of the melting Arctic,” said Saño, speaking from the ice edge north of Svalbard. “The science is clear that climate change could mean more frequent and more intense extreme weather. It is countries like the Philippines that feel the immediate effects of climate change. I appeal to the world's leaders at the climate summit in New York to take actions to protect the Arctic, and cut fossil fuel emissions that are driving climate change,” said Yeb Saño. Yeb Saño is a climate change commissioner and negotiator for the Philippines at the United Nations Framework Convention on Climate Change (UNFCCC). Saño caught global attention after an emotional speech at the UN's climate meeting in Warsaw in November 2013, during typhoon Haiyan in the Philippines. Overnight, he became a voice for climate-impacted nations on the urgent need to address climate change. “What I am seeing here in the Arctic is something that is in danger of being lost forever. It is quite clear that burning fossil fuels is the chief cause of climate change, and the Arctic is at the very center of this man-made crisis. If the world wishes to avert the most catastrophic impacts of climate change, we must rapidly transition to a clean energy future, and abandon crazy projects like oil drilling in the Arctic,” said Yeb Saño. The seven summers with the lowest minimum sea ice extents have all occurred in the last seven years. Current ice conditions suggest that this year is highly unlikely to match the record low level of sea ice extent we saw in the Arctic in 2012. However, the level is likely to be considerably below the long term average, and is consistent with a dramatic collapse in ice extent that has been witnessed in recent years. The sea ice is expected to reach its yearly minimum in the coming weeks. Yeb Saño has signed the Arctic Declaration, a ten point charter for Arctic protection to tackle climate change and to establish an Arctic Sanctuary on top of the world. He is also seeking climate justice on behalf of climate-impacted nations like the Philippines, which had been devastated by super typhoons Bopha and Haiyan. He began his Arctic tour with the Greenpeace ship Esperanza from Longyearbyen, the major port on Svalbard, Norway, situated at 78 degrees north latitude. Yeb Saño is onboard until September 12. PASAY CITY – Senator Chiz Escudero said he was dubious about the zero-based budgeting (ZBB) of the Department of Budget and Management (DBM) and feared that government agencies were unable to comply with the budget approach put in place in 2010 by the Aquino administration. In the budget hearing of the Department of Environment and Natural Resources (DENR) on Sept. 8, Escudero, who chairs the Senate Committee on Finance, said that while the ZBB sounded good, "in practice, I don't see it happening in agencies." According to DBM, through ZBB, programs and projects that will be identified inefficient and ineffective will be terminated and scaled down. On the other hand, those that are still capable of delivering the predetermined end result, especially if the projects directly affect the poor, will be given additional budget. However, Escudero explained that if the government agencies were given a price ceiling--the maximum price that a seller can charge for a product or service--that perhaps they can work on while preparing their budget proposals, and if there was a need to adjust their programs appropriately, then they will do the same per region and each region will probably do the same per province. He further said there was an urgent need to identify how much it costs for a department or agency to build or create one unit of product or service, known as per unit cost, in order to see a more vivid structure of the budget. “If it’s indeed zero-based budgeting then I guess all of you can answer me how much is the per unit cost of doing anything in government. That’s why it is zero-based so I get to find out how much does it cost me,” Escudero said. “How much does it cost government to secure the Filipinos from criminals? How much does it cost the government to secure us against external threats through AFP? For example, we can only secure X number of our population because this is how much it actually costs to secure the lives and property of our citizens,” Escudero explained. “It is the same on the part of DENR. How much does it cost to monitor soil, water and air? How much does it cost to plant a tree, maintain it and protect it until its sturdy enough to grow on its own?” he asked. However, DBM Director Teresita Salud said ZBB was an approach in budgeting and did not literally mean zero. “We are not saying it will start from zero, but determining exactly the efficiency or effectiveness of a particular program or project. If that is so, we may be able to support this project or program to be able to achieve its objective,” Salud said. “Such that we are not into the unit cost, actually, we are into performance base. So at any rate, unit cost is also determines when we budget, such that we would know exactly how much will go to what particular activity or program,” said the director on how DBM sees the ZBB approach. Despite DBM’s explanation, Escudero is insistent in getting DENR’s per unit cost in order to see a clearer view of their budget, particularly on the National Greening Program (NGP)-established plantations, which according to the Commission on Audit (COA) findings were not monitored and non-compliant with the NGP requirements during validation. The DENR is operating under its P23 billion budget this year. However, for Fiscal Year 2015, its budget was reduced to P21 billion since the agency had unfinished programs. QUEZON CITY – Without an acceptable and genuine national strategy addressing the forthcoming energy crisis in 2015, the Trade Union Congress of the Philippines (TUCP) is seeing more brownouts to happen in 2016. TUCP warned that the real extent of the problem will kick in 2016 and beyond if the current Department of Energy (DOE) secretary resort to quick fix and expensive band aid solutions such as renting power barges and generator sets, gas turbines and effect the Interruptible Load Program (ILP) – a program by the DOE allowing malls to run their generator sets with consumers paying for their maintenance and operation costs. Under these schemes, TUCP insists the generating companies and their distribution utility will merrily do their supply and demand games while continuously burdening consumers with high power rates and more brownouts. The implications for workers who will be laid off, for jobs that will never be created, for imperiled businessmen, and for the poor consumers are disaster. “We are alarmed at the silence of the government to directly and genuinely address the power crisis. The silence of Secretary Petilla is deafening. After his ‘emergency powers’ call was made, he is now backpedalling and trying to portray the problem as less than it is. Either he is the ‘boy who cried wolf’ or simply trying to place a band-aid fix because he was unable to make a case for surgery to the president, he clearly has not grasped the true extent of the problem,” said TUCP executive director Louie Corral. Corral warned that the ILP program is just a stopgap measure. He said Meralco customers will now be financially obligated to cover the costs for Messrs. Sy and Gokongwei running their mall generators for their own use on the theory that by freeing Meralco to keep the lights on in other areas that these oligarchs are doing consumers a favor. “We are going to end up subsidizing their malls. But the 2015 power deficit is just the tip of the iceberg. The failure of both the DOE to address the policy gap now makes it inevitable that the crisis will repeat itself in 2016 and onwards,” Corral emphasized. The major policy gap is that government does not incentivize the entry of additional and cheaper power capacity if it continues to allow Meralco to enter ‘sweetheart’ bilateral contracts from their preferred suppliers which will always mean low reserves to ensure high power rates. To bring in genuine competition and additional supply, TUCP is proposing that there is enough leeway in EPIRA for DOE to mandate that henceforth all the distribution utilities such as the market-dominant Meralco, controlling 74%of the Luzon market, to source their power supply every 3 years from international public bidding held under the supervision of the DOE and ERC. TUCP suspects Meralco is again behind the power crisis. Meralco allegedly hostaged its consumers to their Redondo coal plant supplier in Subic. When the 600 MW coal plant was stymied by the Supreme Court issuance of Writ of Kalikasan and the objections of environmental groups, Meralco could have chosen 2 to 3 years ago to take their supply from AES Masinloc which also wanted to set up 600 MW plant or even from GN Power in Quezon. Instead they insisted on Redondo. With 74% of the market share in Luzon, Meralco is proverbial ‘only game in town’ and if they chose any other source, this would have prevented the power shortfall for 2015. “Our call is therefore to clip this self-serving option of their subject the choice of who will supply them to international public bidding under DOE supervision,” he added. PASAY CITY – Senate Majority Leader Alan Peter “Companero” S. Cayetano is pushing for a massive infusion of government resources and infrastructure funds into the development of regions outside Metro Manila as a way to address the congestion problem in the National Capital Region (NCR). “This has been the answer that was given to us: the way to solve congestion in Metro Manila is to build, build, and build; more, more, and more. That is what makes it ridiculous. If you have a house na punong puno na, ang tama bang sagot ay hatiin ang kwarto? Hindi ba ang solusyon is to buy another house o palakihin mo ang lote mo?” he said. Stressing that billions of pesos are being lost due to traffic in NCR every day, Cayetano noted that the NCR-centric policy of the government is the primary reason why Metro Manila is already congested and why other regions in the country continue to experience slow development. “There are 19,137 Filipinos per square kilometer in Metro Manila, ganoon kadami ang tao dito. Ang pinakamalapit nang bilang ay sa Calabarzon, which only has 758 people per sq.km. The rest, ang average is around 300 per sq.km. Karamihan nasa Metro Manila na,” he said. “The solution to decongesting Metro Manila ay hindi ang pinapakita sa telebisyon na mga bagong kalye, bagong skyway. Hindi yun ang solusyon. Lalo lang sisikip ang NCR. Ang solusyon ay gawin ang mga projects na yan sa labas ng Metro Manila,” he added. Citing data from the Chamber of Automotive Manufacturers of the Philippines Inc. (CAMPI), Cayetano noted that around 230,000 to 250,000 vehicles will be purchased in the country next year, 58 percent of which will be filling up the already-congested streets of Metro Manila. “100,000 new cars entered this year in Metro Manila. Add the 100,000 next year, for a total of 2.2 million vehicles in Metro Manila every year na gumagala, kaya traffic. Hindi dahil sa [provincial] buses kung hindi sa dami ng sasakyan. So how would we get inclusive growth? Bakit kasi sa Metro Manila lang?” he quipped. Cayetano suggested that a more feasible solution to decongest NCR is to allot more funds for infrastructure programs in other regions to encourage people to consider looking for employment opportunities and moving in to cities outside the capital region. He also lamented that many Filipino families are robbed of opportunities because the biggest chunk of the national budget pie is allocated to NCR. In 2013 alone, the National Economic and Development Authority (NEDA) approved P184.2 billion worth of 10 major infrastructure projects, eight of which are located in NCR. The two other projects are the Bulacan Bulk Water Supply Project worth P24.4 billion and Mactan Cebu International Airport Expansion at P17.5 billion. Cayetano said this stresses the need for government to promote a more inclusive economic plan that will allow the implementation of a specific economic strategy for each of the 17 regions. “There is no one cure, there is no one-size-fits-all. Kapag nag-economic planning tayo, dapat may national vision; may coherent policy. Pero dapat may 17 regional strategies kung saan ang bawat region ay may strategy at mabibigyan ng pera,” he said. CAMP VICENTE LUKBAN, Catbalogan City – Major General Jet B Velarmino, AFP, Commander, 8th Infantry (Stormtroopers) Division, Philippine Army graced the graduation ceremony of sixty-four (64) students of the Scout Ranger Course Class 189-2013 at Headquarters, First Scout Ranger Regiment, SOCOM, PA, Camp Tecson, San Miguel, Bulacan on September 8, 2014. The sixty-four (64) students that comprise SRC Class 189-2013 came from the different units of Philippine Army and Philippine National Police. After undergoing the tough and rigid preparatory leadership and combat skills training at Camp Tecson, the students were then deployed here in Samar last July 14, 2014 to test and hone their skills and expertise in tactical operations against rebel armed groups operating in the region. Notwithstanding their short stint in the area, the class significantly yielded various accomplishments to include the recovery of two (2) carbine rifles; capture of enemy camps specifically at Barangay Capoto-an and Poponton both of Las Navas, Northern Samar. “Be ready to take on greater responsibility in fighting against unprincipled individuals who intend to obliterate the peace and freedom that our nation have”, Velarmino added. The Scout Rangers are elite forces of the Philippine Army. Ranger qualified personnel are highly-skilled in guerilla warfare able to match the enemy’s cunning, agility, and combat strategies. Their success in the field of combat operations is a replete of stories of heroism, sacrifices, and exceptional combat accomplishments, sometimes beyond the call of duty. During the program, as a token of sincere gratitude to the Commander of the 8ID for supporting the culmination phase of the SRC Class 189-13 training in the Stormtroopers’ area of responsibility, Major General Velarmino was conferred as an honorary member of Scout Ranger class 189-13 making him part of one of the proud and elite forces of the Philippine Army. A former rebel received a check from Gov. Leopoldo Dominico Petilla during the special PPOC meeting on Tuesday, September 2, 2014. 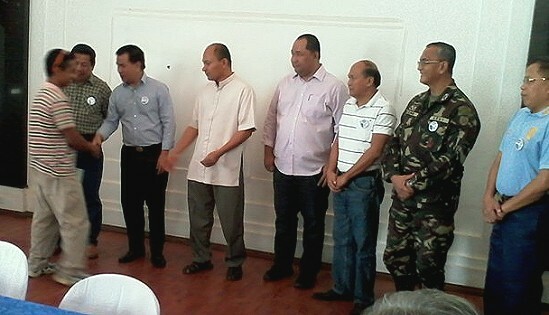 KANANGA, Leyte – Three (3) former rebels get cash assistance during the Provincial Peace and Order Council (PPOC) meeting held at Governor’s Hall, Leyte Provincial Capitol Bldg., Tacloban City on Tuesday, September 2. The three, whose anonymity was requested by the Leyte Provincial Social Welfare and Development Office (PSWDO), received each a total of P75,000.00 worth of checks. Ms. Gwyndalyn Malate, CLIP Focal Person said the bounty comprised P65,000 livelihood assistance from the Office of the Presidential Adviser on the Peace Process (OPAPP) and P10,000 basic assistance from the provincial government of Leyte. The checks were awarded by Leyte Governor Leopoldo Domico Petilla who hoped the said amount will be used by the recipients in improving their living conditions. The governor also accorded one (1) sack of rice and food packs each to the former rebels who were present during the meeting. Cpt. Christopher Badong, Civil Military Operation Officer of the 19th Infantry Battalion based in Kananga, Leyte, said the recipients surrendered to the military, after experiencing hardships in the underground movement of New People’s Army. 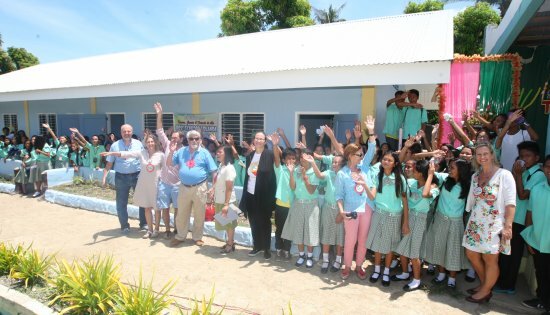 CEBU CITY – In fulfillment of their promise to help Yolanda survivors, The Ramon Aboitiz Foundation, Inc. (RAFI) and its international partners turned over five reconstructed classrooms last August 27 in Daanbantayan, Cebu. RAFI, in partnership with Let's Help Philippines, Christ Leather Fashion, Pesch Family & Friends, Action Calligaro-Mueller Family & Friends, raised funds amounting to P3.4 Million to rehabilitate the school’s heavily damaged classrooms after the onslaught of Super Typhoon Yolanda. The international partners were a group of German businessmen who have long been living and doing business in the country and have been helping Yolanda survivors immediately after the devastation through relief operations and providing housing materials. School Principal Eva Casinillo and the students of Maya National High School (NHS) in Daanbantayan were overjoyed to receive the two-classroom school building and another three-classroom single-storey building. Casinillo said she was very grateful to the donors because not only that the students have their classrooms back, they now have better ones. With stronger columns and beams, elevated flooring, roof insulation, and natural ventilation, the reconstructed buildings were designed to be disaster-resilient. Each classroom also has a lavatory, sink, toilet, concaved blackboards, and two ceiling fans. During the ribbon-cutting and unveiling of the marker, the German donors were delighted to see their names imprinted on the stainless marker, happy that their efforts were also recognized. Anthony Dignadice, RAFI Education Development Unit, said Let’s Help Philippines’ Miranda Konstantinidou and her employees forewent having a Christmas party last year and instead had their money donated to their Yolanda relief campaign. Action Calligaro-Muller and Pesch Family and Friends, on the other hand, are private groups created after Yolanda hit the Philippines. The groups' objective was to provide emergency aid to those greatly affected by the super typhoon. "They (partners) wanted to have a long term and sustainable community project to help schools and children, so they decided to partner with RAFI to help them find a school," Dignadice said, adding that donor Jurgen Pesch of Christ Leather Fashion invited the school to have its graduates apply for work in his company. Daanbantayan Mayor Augusto Corro, Vice Mayor Gilbert Arrabis, municipal council member,Maya Barangay Captain Ali Abucay and barangay council members were also present to witness the turnover ceremony. “One of the good things that Typhoon Yolanda did was to make the generous people come forward to provide and offer their help...and the nice thing about this is these people are foreigners,” Ronquillo said. Ronquillo further told the school that the best way to show gratitude to the donors is to take care of the building and maintain it properly.